We admit students who are in Kindergarten, 1st, and 2nd grade during the 2016-2017 school year. In the morning, students board an imaginary airplane and land in Italy to learn Italian and discover its culture. Violetta and Leandro will help us in the learning process. We will visit a different city every day, where children will tackle new Italian language challenges and fun tests. 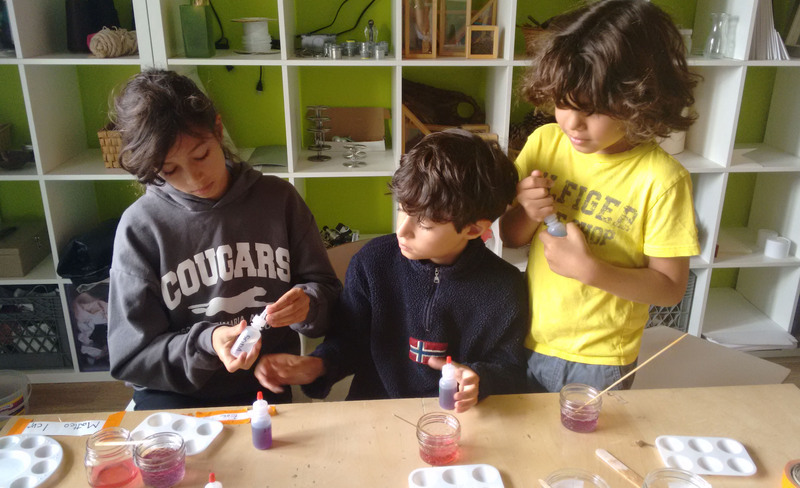 Based on observation and experimentation, the scientific method guides children in the process of formulating questions and hypotheses based on the world around them. During the week, children will experience different scientific experiments based on fundamental elements such as water, air, and electricity. They will collaborate with peers to answer the questions and hypotheses they make. The Italian fables workshop is a space where the children can express themselves. Starting with reading, children will be able to create their own story. Various set-ups will be available to allow children to express with different techniques. Exploring silent books will be a great opportunity for the younger children to compose their own stories. What is a robot? What are the main parts of a robot? How do you make a robot move? Students will be able to answer these questions by the end of the week. Starting from the concept and history of robotics, children will create their own robot. They will learn the fundamental concepts that form a robot’s mechanism. During the week, children will play and control different robots through devices such as iPods, iPads, and smartphones. Students will develop motor skills and hand-eye coordination along with memory. There is no better way to learn a new language than by listening to music! Our journey through Italian culture cannot be complete without exploring the musical tradition of “Bel Paese." While discovering famous Italian songs, children will create their own musical instrument. Children will explore the world of photography and how it evolved through in the last two centuries. They will take photos with different devices using their creativity, experimenting, and playing with colors and images. Students will observe the world around them from different perspectives and choose a specific angle to visualize details and landscapes. Children are digital natives because they are accustomed to technology and they know how to “read” it. On the other hand, many do not know how to “write” technology. Teaching coding in a creative and fun way is important in enhancing awareness about digital technology. Children will be introduced to the concept of coding through computers. During the week, students will use Scratch, a key program that eases the process of writing interactive stories, games, and animation. With the support of mobile apps and software, children will create their own stories or music.